Sometimes we like to take the RV and wander around Florida in January and February. Three years ago our wandering took us to the Midway Campground in the Big Cypress National Preserve. 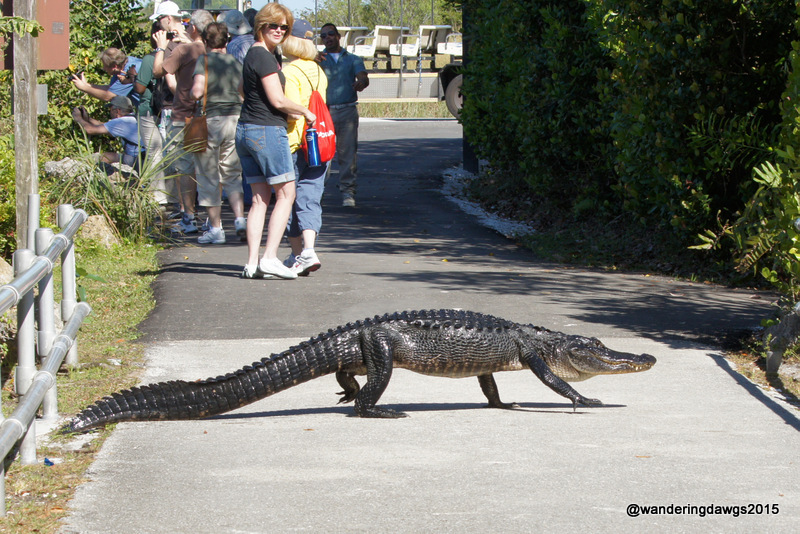 One day we drove to the Shark Valley Visitor’s Center in Everglades National Park to take the guided Tram tour on the 15 mile paved path through Shark Valley. The path is a popular place for bicycling and walking. There is an abundance of wildlife to be seen there in the heart of the Everglades. We had a couple of up close and personal encounters with the wildlife that really stand out. First was the alligator right in front of us that crossed from one side of the path to other. He didn’t care that there were tourists all around. Then there was the Great Blue Heron strutting across the road like he was king of the world. He was on a mission to cross the road and didn’t care about us! Near the Visitor’s Center gators were right beside the path basking in the sun. They ignored all the tourists! Love your gator shot because of the woman’s expression :-). Not unusual for us here in SC but the tourists sure love the gators! Fun post! I loved her expression, too. If she hadn’t turned around they probably would not have even known how close the gator was! 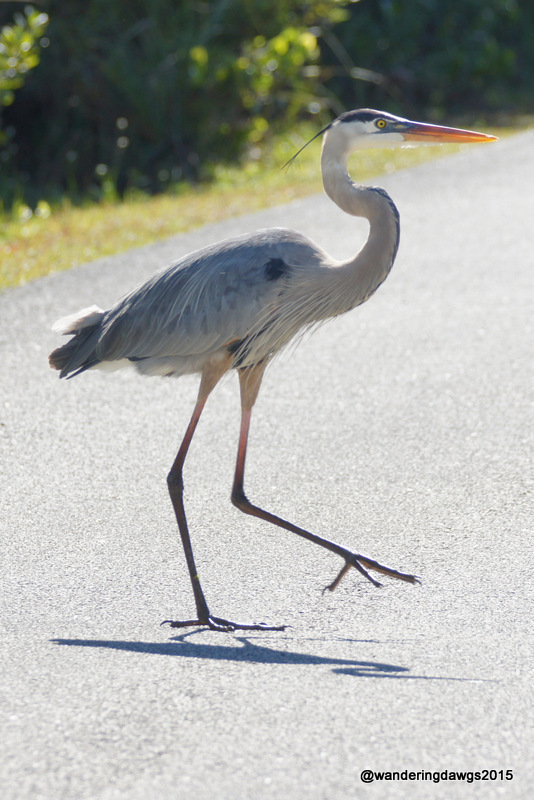 My thought about the great blue heron is “Stand tall!” Wonderful photos! Thank you Jean! That Heron had an attitude! What you don’t see is there are people on bicycles coming toward him on the path and he just kept on going. Love that path!!! The gators and birds are amazing! I agree! So much wildlife! Gators still make me nervous. I don’t think I could ever get used to seeing them sharing a side walk. Was your header shot taken at Devils Tower WY? We’re thinking of stopping there in Sept. What’s your take? Yes, that photo was taken at the Devil’s Tower KOA in 2006 just outside the entrance to the National Monument. I would recommend going. Seeing the tower in person is worth the trip. We only stayed one night and had time to walk on the trail around the base of the tower. There is also a campground inside the park that has some RV sites. It was fun to see the tower from our campsite. Hi Beth, great photos! The ladies’ face in the first photo is priceless! I would have had a greater reaction. Hope you are enjoying your January this year! Thank you Sheila! Yes, we’re having a good January getting caught up on things and planning our spring RV trip. Live that you did the photo challenge, it might inspire me to start taking part in these. They definitely make you think outside your comfort zone. That alligator wasn’t the biggest one we saw in the Everglades! He was moving pretty fast and not interested in the tourists at all!